Although the fighter is being trained for a temporary condition, while the strength-seeker is training for permanent growth, the training principle is the same in both cases. Just as the fighter's trainer keeps a close watch on his charge, so as to discover any signs of waning energy, so must you carefully observe your own condition, and your reactions to exercise and training. We have seen that in order to promote muscular growth it is necessary to adopt a progressive schedule. Give a muscle progressively harder tasks to accomplish, and, providing your condition is right, nature will attend to making that muscle bigger and stronger. but if great and rapid progress is to be made, there must be a certain balance between exercise, rest, and nourishment taken; otherwise even the best system of exercise ever devised will not yield results. Most beginners become fascinated with the progressive schedule of exercise and are apt to follow the schedule blindly, regardless of results. When I first became interested in exercise a kindly old gentleman said to me, "Young fellow, all you have to do is "chin the bar" once the first day, twice the second day, three the third day, and so on; and before long you will be able to chin 100 times in succession and you will get a great pair of arms." Now the old man told me that in simple good faith, and I accepted it as a great idea. I went right to it, and actually succeeded in following the program until the fifteenth day: and after that every thing went wrong. Instead of giving my biceps muscles a rest I did the just the opposite. Convinced that the trouble was not with the schedule, but with me, I practiced "chinning" at intervals during the day, forcing myself to the limit at each session. As a result of this hard work I succeeded in the next month in getting my record up to twenty "chins." but I was so utterly disappointed by my failure to keep advancing at the rate of one a day, that I lost faith both in myself and the progressive idea. The whole trouble was that neither of us knew enough. If the old party had told me to gradually increase the severity of the exercise, and to be content to increase one repetition each week, then it is quite possible that I could have made 52 successive "chins" at the end of the year; as nature would have been given time to build up the necessary muscular tissue. I regret to have to say that the average beginner, when embarking on a progressive schedule, will show but little more judgment than I did. When he starts out he is effectually sold on two ideas. He understands that in order to get all the size and strength and development he craves, he must exercise regularly, and must exercise progressively. So he makes a mighty vow, that come what may, he never will skip an exercising period, and he will keep always abreast of the advancing schedule. He may even go so far as to plot out his schedule for weeks in advance, making a chart, which calls for so many repetitions of an exercise on this day and so many more on the next. So many strands to be stretched this week, and one or two more the week following. Or so many pounds to be lifted as the days go by; or perhaps an ever-increasing number of "dips" and "chins" and "squats." And each day he will "check off" each exercise as he completes it and he has blind faith that if he can only keep up with the schedule, nothing in the world can prevent him from rivaling Hercules. Now, it must be admitted that for a time, while the work is still easy, everything will go along swimmingly, and the development and strength which makes itself evident, seems to prove the value of progressive work, leads to high hopes, and encourages one to continue. It is only when the daily exercise becomes so severe that it tires you, that there is any danger of over-work. And as soon as your body is over-worked, progress and growth will cease for the time being. There is one infallible way of telling whether you are on the safe side and that is your enjoyment of the work. I do not mean the mental gratification that comes from keeping up with the sacred schedule, but the actual feeling of physical satisfaction which comes from a good muscular work-out. If after your exercise, your bath and your rub-down, you feel fit to battle for a kingdom, then your schedule is right. If, on the contrary, your exercise so exhausts you that it is hours before you again feel brisk, then the work is too heavy, and you must either take a rest, or else reduce the severity and amount of the exercise. Progressive exercise is positively the only road to great strength, but after all is said, the important thing is not the way your schedule progresses but the way you progress. So you must learn how to make the schedule fit you, rather than to sacrifice yourself to the schedule. On the other side of the question, it is plain that unless you do exercise with a fair degree of regularity, progress will be nil. You won't get anywhere if you exercise by fits and starts, for muscle and strength will not put in an appearance until your body recognizes the demand for those attributes. Go barefoot every day for a month, and before the month is ended, the soles of your feet will have toughened. Shovel coal for an hour every day and before long the palm of your hands will become horny and calloused. But if you go barefoot, or shovel coal only occasionally you will get nothing except cuts and blisters. So it is with exercise. Within certain limits the supply will equal the demand; providing the demand is constant. However, when building up strength, while regularity of exercise is important, strict regularity is a mistake. Suppose, for example, your program requires you to exercise once in 48 hours, and for an hour at a time. You can best spare that hour in the evening, probably just before you go to bed. Say that this week the exercise periods fall on Monday, Wednesday, and Friday evenings. On Monday and Wednesday everything is lovely, for you have been sitting at your desk all day, and your body is crying out for exercise. But on Friday you are sent around the city to interview a lot of clients, and you have to walk miles and miles, and you have a date for dinner, followed up by dancing until far after midnight. When you go home at 2 A. M. your body is tired. You can get only a very few hours sleep at most, and the idea of staying up for another hour and forcing your weary muscles to do a lot of hard work is utterly foolish. But I give you my word that I have known it to be done by some of these over-zealous enthusiasts. Why in a case like that the proper thing is to say, "Oh, well, this is not Friday night but Saturday morning, and I will take my workout on Saturday night this week." The general rule is, that the more vigorous an exercise, the less often it has to be done. That is the great beauty of progressive strength-exercises. When you have made your arm so strong that you can reach up, grasp the limb of a tree and "chin" yourself a couple of times with one hand, then all you have to do is perform that stunt two or three times a week. You will keep growing in strength and the exertion is of such short duration, that a minute later your arm-muscle has gotten back its energy. And yet only a few weeks previously while building-up that arm strength, you had to use both hands to "chin" yourself, repeat a lot of times, and require a correspondingly long time to get back your strength and your energy. Therefore you have to guard against working to frequently; and you have to also learn to regulate the amount and kind of exercise you take at any one time. A great deal depends on how much time you are willing to spend at practice. If you are a real dyed-in-the-wool enthusiast you can practice as the professionals do; which is to distribute the work over a couple of hours, of which only twenty or thirty minutes are spent at actual work, and the rest of the time is taken up by the in-between rest-periods. If you prefer to most of your free time at your other hobbies, and can spare only two or three hours in the whole week, then you must be content with slower progress, and had better adopt the special program which I will recommend later on in this chapter. The ideal way to exercise is to arrange things so that on the days you exercise, you do a series of movements that provide work for every part of the body, one part at a time. But in that case you must allow plenty of time for rest. There are hundreds of young fellows who prefer to spend three evenings a week at the gym, instead of going to the movies or dances. And if they can do it, why not you? True, they go to the gym for the fun they get out of it, whereas you would go for serious work. And since there is no room to do serious work on a gym floor that is monopolized by the basketball players and "class drills," you will do better to take your exercises at home. It occurs to me that I may have given the wrong impression when I laid so much stress on the necessity of rest periods between exercises. It sounds as though those exercises were so terribly severe that after each exercise or "stunt" you would have to spend several minutes "coming to." as it were. I harp on this subject, because it is vital that I make you understand the difference between training "just for condition," and training for strength. A man training for condition will go to his gym, his club, or his athletic field, and for an hour or so he will move around so briskly that he will sweat profusely. And the more he sweats, apparently the happier he is. If he works so strenuously that finally he is standing in a pool of perspiration, he will consider that he has done his duty by himself, have his shower and rub-down; and then go around bragging about what a "grand work-out' he had. He said it! Literally he has worked himself out, and that is exactly the thing the strength-seeker cannot afford to do. If your idea of training is that you must dash from one exercise to the next with the sole purpose of "getting up a sweat," then I can tell you right here that you will never get very strong, or well-developed until you give up that idea. I have seen powerful young men preparing themselves for a "Strong Man's career," stay in their training quarters for an hour and in the course of that time do only a dozen exercises, and although those exercises were of an extremely strenuous character, these young men would never work themselves up to a profuse perspiration. They had sense and experience enough to realize that one cannot build up muscular tissue, if one sweats to a degree which makes one lean; nor build up energy if one is continually spending all the energy in stock. Of course, if the weather was extremely hot, they would perspire just as any healthy person does, but as their muscles were in superb condition they would perspire less than most do. When training, a "Strong Man's" custom is to first "warm up" the muscles by a little light work, because one can no more do feats of strength when the muscles are cold, than will the engine of your automobile develop real power if it is cold. After the light work the athlete will perform some vigorous stunts. It may be lifting a heavy bar-bell from floor to chest, and then pushing it aloft; and repeat. But the instant the work of lifting becomes too difficult, he stops and walks around for a couple of minutes. He is not particularly out of breath, because he selected a weight that was heavy enough to make him really exert himself and therefore couldn't be lifted many times in succession. And he is not particularly tired because he deliberately stopped before he had to. He could have lifted more, but he is saving his strength. After a couple of minutes' rest, he works another set of muscles, this time preferably some of the smaller muscles, like those of the forearms; since that requires considerable local exertion, but no great output of bodily energy. And then another bit of hard work, such a dead-weight-lift that requires great and powerful contractions of the thigh and back muscles. Then more rest, and perhaps some little special work for the calves of the legs; as that also can be done without a great output of energy. And so on. And always he saves until the last his hardest stunts -- the ones that require the use of almost all the muscles, and which therefore use up energy in large amounts. Never does he make the mistake of doing the hardest exercises, or stunts, in the first part of the training hour. If he did that, he would be working under the disadvantage of having diminished his strength and energy, and of working with tired muscles. If you happen to be a track-athlete, you know that if you had entered your name for the high-jump and the three-mile-run you would prefer to do the jumping first. You could do the necessary dozen or so jumps, and if you had a few minutes' rest you could still show your very best in the distance race. But if you first ran at your best speed for three miles, and then after fifteen minutes' rest had to compete in the high-jump, you would most likely make a miserable showing. The long-continued exertion of the three miles would have sapped your energy and taken all the spring out of your legs. Now I have more than once watched several experienced young huskies training in company, and vieing with each other in the performance of difficult stunts and arduous lifts. Suddenly one of the strongest would walk toward the showers, and if the rest said, "What is the matter, Gene? Quitting so soon?" he would reply, "Yep, Had enough for today. Feel just right. Gotta save myself you know." Or perhaps it will be, "Up late last night, and got hardly any sleep. Haven't got the pep to keep up with you fellows today." None of the rest will coax him to return as any one of them is apt to do the same thing any day. One and all of them have had enough experience to know it is foolish to force oneself to do hard stunts when not feeling right; especially if there is no real emergency or necessity. A professional "Strong Man" carries the principle of his training right into his "act." Most "strong acts" are gotten through with in ten or fifteen minutes. If the performer is particularly famous, as much as twenty minutes may be allotted to him; but rarely more than that. If it is fifteen minutes, the athlete has to get through a number of difficult and spectacular feats in that length of time. An ordinary physical-culturist sitting in the audience and noting the power required to do the different stunts, will wonder how in the world even the strongest man can do such an act, not just once, but a dozen times every week. The secret is, that the performer has carefully arranged his stunts in such order that a hard feat will be sandwiched in between two comparatively easy ones. And always the "big feature" -- the feat which requires a terrific output of strength and energy comes right at the end of the act. That happens to be the correct thing to do from the theatrical standpoint, since an act should always be arranged as to "work the audience up" to a grand finale. But the athlete -- the "Strong Man" --has to do it that way; for if he did his hardest stuff at the opening of the act, he would be very apt to do the following feats in a ragged , or sloppy manner. In order to "put over" the impression of great strength the performer must do the hardest feats as though they were child's play to him. When I said that the performer alternated hard stunts with easy ones, I meant easy for him; for it is but rarely that an ordinary man, even if he is a "husky," can do even one of the easiest feats of a "Strong Man's" act. Actually some of those men are so strong that they will rest up while doing feats that are far and away beyond the power of the average man. To illustrate: How many of you read these lines "muscle-out" a 50-pound dumb-bell in each hand? Probably not more than one out of every hundred of you. There is a "Strong Man" who does it in has act as a "stall." Near the finish of his act he has a not very showy, but particularly difficult act, which tires him for a moment. Everything is set for the big finish and he accordingly walks over and makes a bluff; tries the big stunt and purposely fails. Then he looks around in apparent embarrassment and happens to spy a pair of fifty-pounders. He picks them up one in each hand, curls them, puts them up a couple of times, and finally "muscles them out." All the while he is actually smiling. 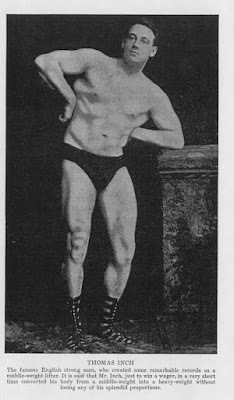 And that smile brings down the house; for every man in the audience knows how hard it is to "muscle-out" a pair of fifties, and is vastly impressed at seeing he stunt done with such nonchalant ease. And while bowing in acknowledgment of the applause, the performer grabs off another thirty seconds to rest. Then feeling fresh again, he will do the big final stunt successfully, and will walk off the stage only to come back and take several curtain calls. A "great showman!" you will say. I grant you all that. But can you imagine a man so strong that a little drill with a pair of fifties affords him not work but a rest! Like most other professionals, that man, when on the road take no exercise except what he gets in performing his act twice a day. Why should he? Before he got on the stage he spent months, and maybe years, in building up his muscles, and developing his strength; and once having gotten that strength he has no trouble in keeping it. If he was so unwise as to do heavy exercise "on the side," while filling an engagement, he would just be using up the energy needed in his act; and I can assure you that thirty minutes a day of "strength stuff" is no weakling's task; even if it is split up into an afternoon and evening act of fifteen minutes each. How does all that apply to you, who have not the least desire or intention to go on the stage, or to earn your living by the strength of your muscles? The connection is that unless you were interested in great strength you would not be reading this book; and all I have been doing is to try and show you how even the strongest men train so as to avoid the over-exercising that prevents the building up of energy-reserve. Let us assume that, although you are of average size and strength, you have become seized with the ambition to become very strong. It may be that you feel you need the strength so as to be able to excel in your favorite sport; or it may be that you place a high value on strength for its own sake; and think it would be a glorious thing to be two or three times as strong as any of your friends. Or perhaps you have been fascinated by the magnificent personal appearance of some celebrated "Strong Man" and have figured out that if you can get strength like his you will get a shape and development like his. Never make the mistake of thinking that you can get strong by learning to repeat a heavy exercise, as often as you can do a light exercise of similar character. Don't figure that since you can take a 10-pound dumb-bell in your right hand and put it up 100 times, that you will be ten times as strong if you can only learn to do the same thing with a 100-pound dumb-bell. If you have already figured that way, don't try to actually do it. To put up the light bell 100 times takes so little strength and energy that almost anyone can do it without becoming noticeably tired. To put up a 100-pound bell takes a great deal of strength and energy, even if you make but a few repetitions; and if you devoted all your time to making as many repetitions as possible, your muscles would get bigger but your energy would fade. Didn't you ever notice that a man after doing some particularly heavy stunt will say, " I tell you, boys, take takes it out of you." By "it" he means energy. The cardinal rule is that the heavier the exercise, the fewer times it need be repeated. This applies equally whether you are using iron weights, rubber or steel springs, or the weight of your own body. As we have already seen, to "squat" (or do the "deep knee-bend") is so easy that it soon becomes just a matter of endurance. So don't assume that because it is so darn easy to squat fifty times on both legs, it would be the proper caper to learn to make fifty squats on one leg. The two stunts take an entirely different kind of strength. Why, I know dozens of young fellows who can squat one hundred times using both legs, who have not the strength to squat even once using the strength of only one leg. I could go on and give you similar examples of exercises for every part of your body, but these two ought to be sufficient. Work this way: As soon as an exercise becomes very easy for you make it harder; not by increasing the number of repetitions, but by adding to the resistance the muscles have to overcome. Don't force yourself to repeat the heavier exercises as often as you did the lighter one, and when the heavier work becomes easy, why, make it still heavier, and reduce the counts accordingly. It is possible to work that scheme on every part of the body, and you can do it either by sticking to the same set of exercises and adding progressively to the resistance; or by substituting different, but more difficult exercises for easy ones. After you have so practiced for a few months, you will find that instead of having to do, say, twelve exercises, each one hundred times, you do each exercise but five times each. So as an expert you do only sixty repetitions altogether; and while they make you use far more strength, they require the expenditure of far less energy. Furthermore, the strength-exercises produce and entirely different kind of muscle. Repeated strength-exercises create the maximum of size, and bring out the full beauty of outline; while the lighter exercises only produce muscles of moderate size, which have but little strength and less shape. Now to help you guard against the second common mistake. Don't rush through your strength exercises. Don't jump right from one exercise to the next. Give yourself plenty of chance to rest. You should allow almost as much time to do a dozen strength-exercises, each a few times, as it took to perform the lighter exercises ten times as often. Rush your heavy work and you will finish up "all in." Take your time and you will "finish strong." with your pulse and respiration only slightly above normal, without profuse perspiration, and with a great feeling of strength and energy. If possible, arrange the exercises on the professional's plan, spacing out the harder ones with easier ones in between. There is no magic in exercising a particular number of minutes. Even if you have been assured that "thirty minutes a day" is the correct program, that does not mean that you will kill yourself if you exercise thirty-one minutes, or that you will fail to get results if you work for only twenty-nine. Always gauge the amount of work by the way you feel. Your work-out may call for fifteen exercises, but if you feel unusually tired by the time you have finished the twelfth, quit at once and call it a day. It is better to let one or two sets of muscles go without their regular work than to make an overdraft on your energy bank. On the other hand, on days when you feel particularly fit, there is no harm in doing a little extra work; although instead of making the exercises a little harder or longer, it is better to employ that extra energy in making of couple of tests to see how strong you are getting to be. Beware of rigid schedules. It would be exceedingly pleasant if you could go on forever gaining at the same rate of speed, but nature simply won't work that way. Don't insist that your muscles must be just so big on January first and just so much bigger on February first. That also goes for strength. Don't believe for one minute that you must be able to lift or pull so many pounds one week and so many more the next. Do your exercises as regularly as you can, and with the best of your ability; and strength and development is bound to come. Now if you are one of those fellows who can devote only a little time each morning or evening to the pursuit of strength, while in the early stages - while the exercises are still easy - you can go through the whole lot, even if you have only thirty minutes to spare for practice. But when the exercises get harder, you will have to reduce their number if you are going to adhere to the progressive principle. This can be done in different ways - by dividing he exercises into groups.You might do all your arm, shoulder, and upper-back exercises one day; all the leg and lower-back work the second day; and the chest, abdominal and side-exercises on the third day. It would seem better to mix up the exercises so that while you did only four or five exercises each day, one of them would be for your arms, another for your legs, and so on. Under this plan you can make good progress, although you won't gain as rapidly as does the other fellow who gives up tow hours to strength culture on three or four evenings of the week, and who works all his muscles at each exercise session. Even if you are working this way, and but little actual work every day, you be actually in action only eight minutes out of the thirty. You must never force yourself to exercise every morning or night whether you feel like it or not. And whichever plan you are working on, never hesitate to "lay off" for a few days if for two or three days in succession the exercises have seemed more like a laborious nuisance than an exhilarating pastime.